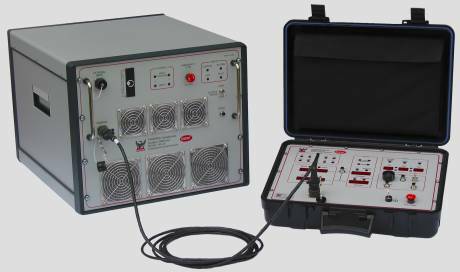 The most advanced controlled current source available for electrical methods exploration, the TXU-30 incorporates many of the features of the groundbreaking new technology developed in 2001 for the 160 kW Phoenix T-200 unit. The TXU-30 is a compact portable model, combining substantial power output (20 kW) with great reliability, flexibility, and user-friendly operation. •	no more service and spare parts supply headaches. •	possible capital cost savings. Advanced microprocessor control provides superior performance across the board. 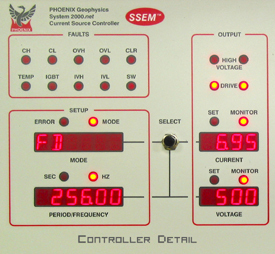 Large, bright LEDs display instrument status and critical values. Simple, straightforward controls make it easy to adjust all operating parameters within allowable limits. Use the cable-linked remote control panel to operate the TXU-30 from up to 30 m away. Manage your EM transmissions in the comfort of a heated or air-conditioned field truck cab! You’ll also appreciate being able to talk with the rest of the crew by mobile phone or radio without having to fight the noise (audible and RFI) of the MG. In highly resistive areas in the past, users have relied on dangerously high voltages in an attempt to achieve an adequate signal-to-noise ratio at the receiver. The TXU-30's built-in GPS (Global Positioning System) satellite-synchronized timing control, coupled with companion GPS-synchronized receivers, solves this problem. Because the entire system is synchronized, receivers can maintain proper registration while stacking even extremely weak signals. The signals can be stacked as long as necessary until the S/N ratio is acceptable. The TXU-30 continuously saves time series records of its output current and voltage on a removable 512 MB flash memory card. This information, required for deconvolution calculations in Spectral IP, can be transmitted to a companion receiver system over either a wireless or an optional cable link. Alternatively, the data on the flash memory card can be uploaded to the post-processing computer via a high-speed, low-cost interface.